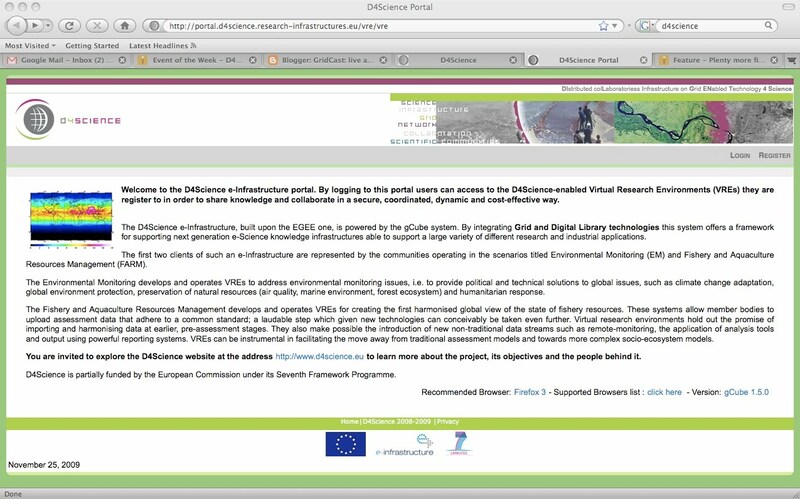 During the last hour we've been walked through the D4Science e-infrastructure portal which allows users to access Virtual Research Environments (VREs). So far D4Science hosts two different types of VREs - Environmental Monitoring (EM), which addresses environmental monitoring issues, and Fishery and Aquaculture Resources Management (FARM) which develops and operates VREs for creating the first harmonised global view of the state of fishery resources. D4Science provides a technological solution to community problems. It aims to answers questions such as how to set up a VRE, how to invite users, as well as deciding on content and functionality. For this, we were given a demonstration on how D4Science's portal guides a user through this process. With the help of a wizard, setting up a VRE becomes a stepwise process, including deciding on a timeframe for the VRE, included content, applications etc. And once set up and approved, the portal provides a clear interface for managing users roles and rights, and sharing data with other users via the D4Science workspace. Included in the session was a demonstration of how AquaMaps uses the D4Science portal for its own use. AquaMaps provides species distribution models for marine species allowing users to search, and experts to review maps on their project website. (For more info on AquaMaps why don't you read this article in iSGTW?). But AquaMaps wanted access to more computer powers and more complicated functionalities. By turning to D4Science it seems that the AquaMaps VRE can now carry out these more complicated searches (e.g. focus exclusively on data that is of interest to divers), giving users filters that are unavailable on the project website.